I’m crazy for pumpkin this time of year. I’ve already had pumpkin ravioli, pumpkin chocolate chip bars, and pumpkin muffins so far this season so figured it was time to whip up some pumpkin bread, too. This particular recipe is from good ol’ Betty Crocker’s Cookbook and calls for nuts and raisins but I thought that since chocolate generally makes everything better, why not try adding it here too? It was an excellent thought to have. 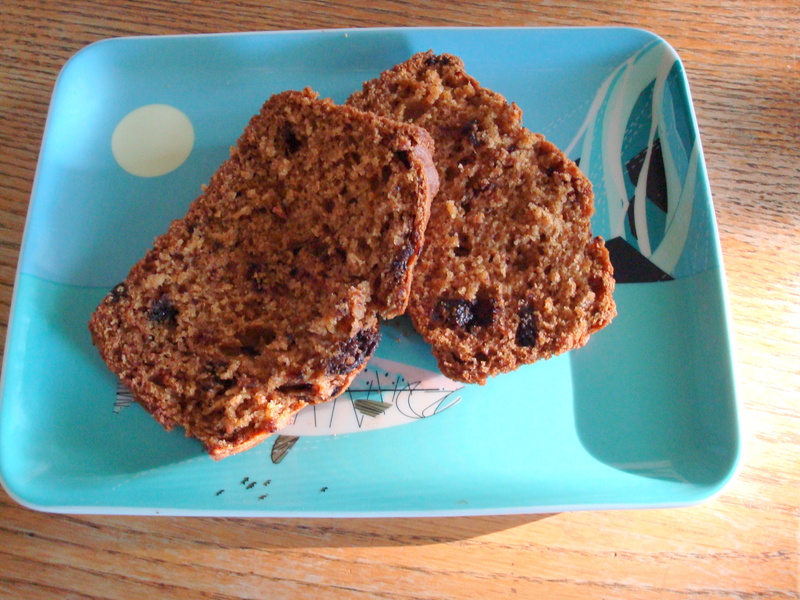 This bread is moist and a little spicy thanks to ground cloves and the chocolate chips made it feel dessert-like but I felt less guilty eating it as dessert because I figure it can’t be too bad for you since pumpkins are technically vegetables, right? And vegetables are good for you! For sure. Last week was freakishly warm for October in the northern Midwest but next week it is looking much cooler which is getting me thinking about my Thanksgiving menu already. Look for side dish and dessert ideas for Thanksgiving from me in the coming weeks! 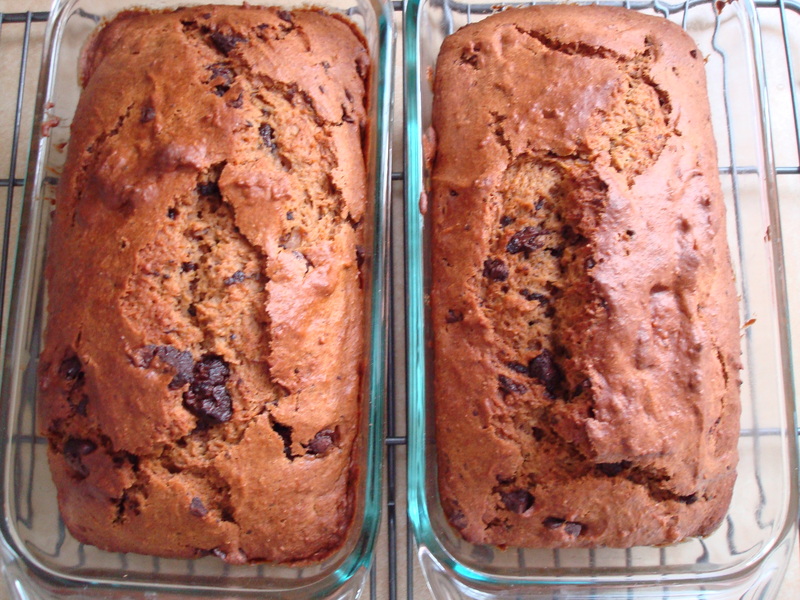 Mix-ins: Betty Crocker suggests ½ cup coarsely chopped nuts and ½ cup raisins, but I used 1 cup chocolate chips. Take your pick. Move oven rack to low position so that tops of pans will be in center of oven. Heat oven to 350 degrees. Grease bottoms only of 2 loaf pans, 8 ½ x 4 ½ x 2 ½ inches, or 1 loaf pan, 9 x 5 x 3 inches with shortening. Mix pumpkin, sugar, oil, vanilla and eggs in large bowl. 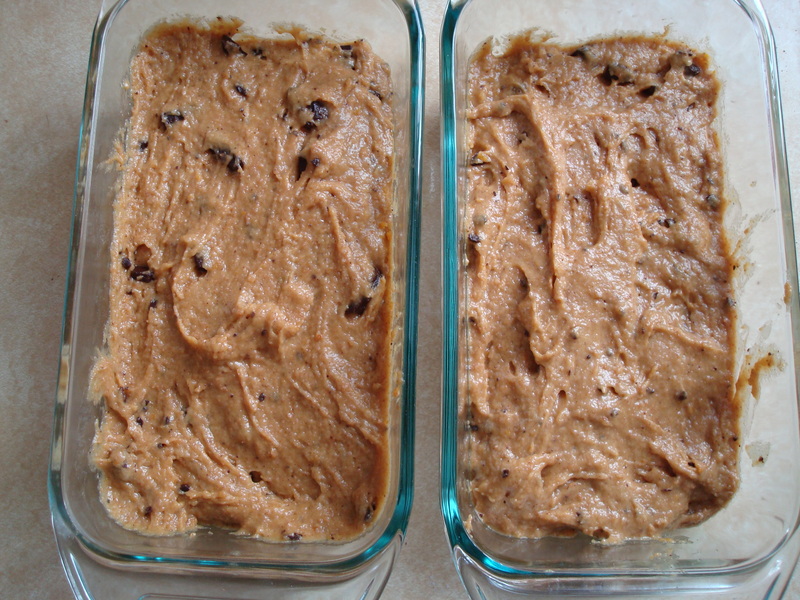 Stir in remaining ingredients except nuts and raisins or chocolate chips. 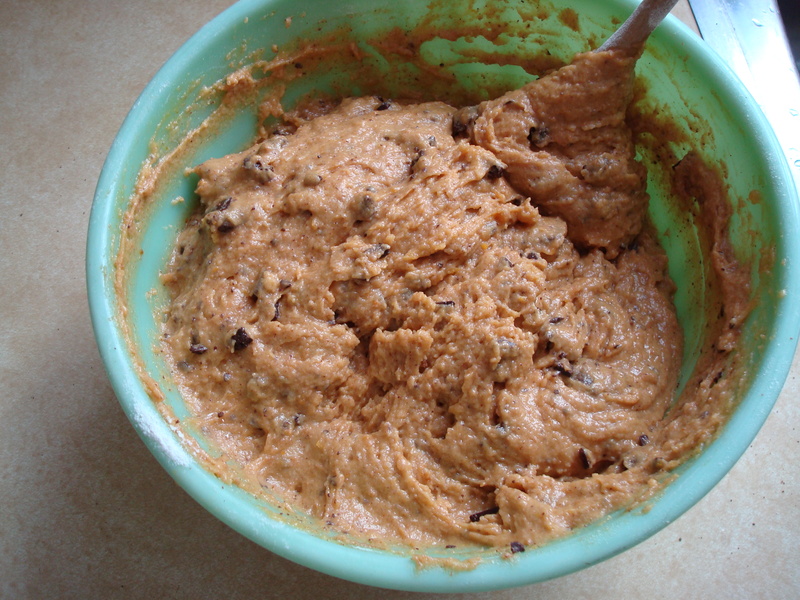 Stir in nuts and raisins or chocolate chips. Divide batter evenly between pans. Bake 8-inch loaves 50 to 60 minutes, 9-inch loaf 1 hour 10 minutes to 1 hour 20 minutes, or until toothpick inserted in center comes out clean. Cool 10 minutes in pans on wire rack. Yummm!!! Just made this for Thanksgiving. Thanks Kj!!! Happy Turkey Day!!! Gobble Gobble! I will be making this bread this weekend, it looks wonderful. I make my own pumpkin fresh from pie pumpkins that I bake. So I will see how it works out in this recipe and let you know. I like all things pumpkin. I have been making my own pumpkin from the pie pumpkins for the last 3 years, I think it makes the pumpkin pie taste better but that is just my thoughts.